Dr. Funchion, Associate Professor of English and American Studies with the University of Miami’s Department of English, used Powtoon as a video production tool for creating an introductory hook to his course entitled Con Artists in US Literature. This video trailer set the stage for what students could expect during their course and defined the key learning objectives centered around the content. Interactive presentation tools offer numerous opportunities for faculty and students alike to enhance communication, productivity, and group collaboration within a course. This white paper will explore interactive presentation tools that offer a component of interactivity for the learning audience. 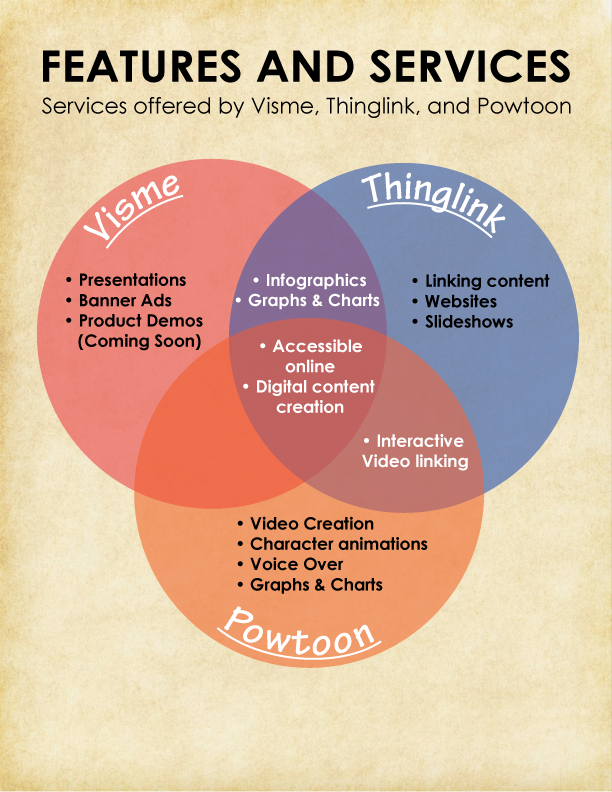 This Hot Team report covers web-based content creation and linking tools, such as Powtoon, Visme, and Thinglink. Powtoon allows users to create interactive videos with character animations, voice-overs, graphs, and charts. It contains premade themed formats to help users create videos that are entertaining, information-rich, professional-looking learning tools. Visme is a visual aid that helps bring data, metadata, and statistics to life through the creation of infographics, banner ads, and graphs. Visme can also be used to design unique PowerPoint presentations. Lastly, Thinglink is a tool that can embed interactive links within content such as graphics and videos to direct students to relevant sources information all over the web. Thinglink even allows the option to sync with content management systems such as WordPress and Blogger to easily integrate linked content into websites. All three of these tools are web-based and hosted in the cloud. Users only need to sign up for an account (for the free version) in order to start creating their projects. Also, premium versions are available for all three services. Both Visme and Thinglink can be used collaboratively in the premium versions, where multiple users can edit the project at the same time. Each service has a simple design interface where you can get started creating content by clicking the “Create” button in the top navigation bar. Each service allows the user to customize the project as little or as much as they’d like. Both Visme and Powtoon provide a comprehensive list of templates that allow the user to find a theme or format that fits their specific subject content, although users can also start from scratch and build their own using the services’ database of media objects. Users can create hyperlinked areas on images or videos by clicking on the image or video of their choice and inserting links to content using Thinglink. Overtime, a user can accumulate a database of linked media objects that are easily sharable to different groups of learners. The graphic user interface for each service provides a main workspace where the user can select and add media objects to their project from the service’s graphic libraries. Users can also edit the media objects using bounding boxes to control size and position in the workspace. 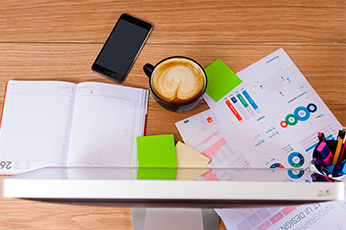 These workspaces are similar in nature to graphic design interfaces of programs such as Photoshop, Paint, iMovie, and Adobe Products but easily-accessible libraries make for more user-friendly execution. Each service provides features to publish and export finished content as an embeddable website object using HTML code or to create a direct web link to the object. All of these services turn once-static images and content into engaging, interactive media objects. These interactive applications are being used more and more by faculty, staff, and students looking to get more out of their traditional presentations. Because they are cloud-based, these services offer a collaborative solution for online and hybrid courses where students don’t get as much in-person interaction. For the most part, these tools are user-friendly and don’t require a high level of technical skill. These interactive tools are also being used heavily in eCommerce for marketing products to consumers and by government sites to inform voters on local issues. Interactive presentation software can come in handy anywhere that online viewers can engage collaboratively with information. Interactive presentation software can be used by professors and students in different ways. For professors, interactive presentation software offers an effective alternative to lecture, allowing for more in-depth coverage and complex interaction in a way that is unavailable through a traditional presentation. Educators can embed documents, videos, and other artifacts in their presentation, providing a mashup of readings and lecture. For example, a ThingLink presentation could have images, videos, and readings embedded in a single digital object. Additionally, learners are actively involved in navigating through the presentation, unlike other forms of presentation which constrain learners to a single linear narrative. Interactive presentations give learners the ability to engage with the information according to their own learning styles which in turn results in more synthesis of the information. Visual learners can appreciate the qualities of Visme, Powtoon and Thinglink and all learners can revisit the presentation again and again to reinforce learning. Interactive presentation software appeals to a variety of learning and teaching styles. Students can engage in a way that supports their personal study habits and educators can present more detailed information in a variety of formats in a single digital object. Learning environments are evolving and future educational experiences will look much different than what exists today. As faculty members continue to find new ways to reach students, presentation tools will continue to grow in popularity. Engagement does not necessarily equate to student learning, however, so the relationship between instructor and student must continue to be nurtured. Teaching-with-technology allows faculty members to engage with students in different ways and new, mobile-friendly pedagogical strategies can be implemented as a result. Likewise, students can present their ideas in creative ways while collaborating with their peers (even from a distance) using these tools. Ultimately, the goals of educators are to create environments where students become effective communicators, gain abilities to critically think about academic content, and learn how to collaborate with team members. Interactive presentation tools help create a learning environment where all of these things are possible, even in ever-evolving classrooms. At the institutional level, social media is used to share information, advertise current events, and recruit new students. Embedding interactive presentations within traditional social media messages enhances marketing communications. For example, a static map of campus becomes an interactive image using Thinglink. On that dynamic campus map, a prospective student could click on the location where the admissions office is found, and a Powtoon video shared via YouTube could help a student learn about the upcoming processes involved with getting accepted at the university. 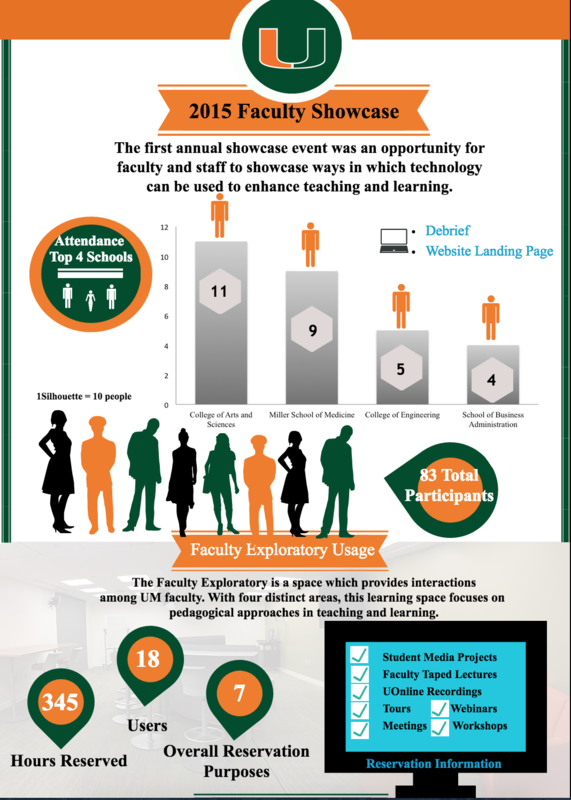 Or, that same prospective student could click on the location where their expected degree program is housed and find an infographic (created using Visme) that provides data and information about the program, recent accomplishments, and its alumni successes. Higher education is in a sea-change of teaching and learning strategies and as a result, both active and distance learning have become major foci in teaching. Educators can use interactive presentation software to ‘flip’ the classroom, for example, to replace their traditional lectures. Students can refer to course content both inside and outside the classroom and embedded media can provide a single point for students to get all the materials needed for learning in one digital object. Educators can use interactive presentations to scale learning up or down, allowing them to teach to multiple levels of understanding. Additionally, more detailed content info can be included without sacrificing classroom time and focus. Interactive presentations could also be used to convert assignments into active learning opportunities. Traditional papers or powerpoint presentations can be turned into interactive presentations and then be used for peer-to-peer learning. Interactive presentation software helps students engage in higher thought processes. Rather than remembering and recalling, students must incorporate information into their knowledge base and creatively apply it to create a presentation that their peers can then use to learn from as well. Interactive presentation software ushers students to engage in the highest levels of learning in Bloom’s Taxonomy in that they must synthesize and evaluate information which in turn promotes higher order thinking and encourages students to incorporate classroom learning into their knowledge base. Finally, interactive presentation software is another effective tool to transform the digital learning environment. Interactive presentation software is used to foster active learning that reaches beyond the confines of the classroom. Being in a digital environment, students inside and outside the classroom can participate in the presentation. What makes interactive presentation software especially significant is the final product. Students can continue to learn from their peers and professors using the digital objects created by interactive presentation software, promoting engagement and peer-to-peer learning.